I Went to The Plaza's Finishing School to Learn How to Be a Better Millennial. Here's What Happened. As it turns out, I am a monster. Not only did I arrive at the Plaza for Myka Meier’s social and dining etiquette course five minutes late (I blame the R train), but I was also wearing a T-shirt, which, in a room of adults dressed in suitable prom attire, felt on par with arriving completely naked. I sat too close to the table (you should be 4 inches away, apparently) for easier access to the spread of hummus and cheese, which I learned I was not to consume until after I had placed it on the correct section of my plate (bottom right is for spreads and top left is for refuse like pits and cheese rinds). I dropped an olive, sliced the Gruyere at the wrong angle, and nearly knocked over my water glass while taking furious notes. Clearly, my upbringing in a cereal-for-dinner sort of household had not prepared me for this. That’s where Myka Meier comes in. Meier is the founder and director of Beaumont Etiquette, a contemporary finishing school stationed within Midtown’s Plaza Hotel, where she serves as the primary instructor at the helm of the program’s courses. And while it’s only natural to associate “etiquette” with ‘50s debutantes and Julie Andrews in The Princess Diaries, according to Meier, her curriculum is “not your grandmother’s etiquette.” In spite of her prestigious studies in Switzerland, and later in London as a mentee under a former member of The Royal Household of Her Majesty the Queen, her course is a little nuanced: It’s modern etiquette tailored to urban millennials -- New York millennials, in particular. In short, it’s intended to serve as something of a guiding light for those who dare to wear sweatpants to brunch, photograph their Smorgasburg snacks before consuming them, and claim an extra seat on the subway for their Strand totes. I had enrolled myself in the course in an effort to determine whether or not I really could be saved from my millennial self by way of finishing school (which, as a 20-something native New Yorker, was allegedly catered specifically to me). If all went according to plan, by the end of the session, I would be the sort of poised New York woman who doesn't send a text saying “I’m three blocks away!” while still pantsless in my apartment. The choice of venue was obvious given the subject matter: In the grand scheme of New York, The Plaza is high-society manifest. But for all its stately clout, the Midtown venue -- which offers a $75 spread of tea sandwiches -- does not exactly cater to young folk. We convened for the course at 7pm in the famed condo/hotel’s Palm Court, at which point the restaurant’s hostess promptly ushered us to a series of tables to the left of the round trellised bar. Each was set with cloth napkins, silverware, and cardstock itineraries outlining the evening’s proceedings in bullet points (“How to be the most charming person in the room,” for example). Once the wine had been poured, we made our perfunctory introductions around the table. I shook hands with the girl to my left, who was dressed in a neat black cocktail dress and seemed to delicately hold my hand for a brief moment rather than actually shake it. She went on to mention casually that she was in New York to assist Meier with her upcoming course in children’s etiquette. The woman to my right, who quickly motioned to the waiter for a wine refill, told me that she was a mother, hoping to pass some of Meier’s wisdom along to her own millennial daughter -- who had apparently opted out of attending the course first-hand. “Your mother must be so proud you’re here!” she exclaimed, reaching for her newly filled glass. I nodded courteously, envisioning my own mother, who was most likely at home in Brooklyn, eating Chinese takeout directly from the container. Shouting above the chatter in the restaurant, a woman on the opposite end of the table explained that she and her grandmother, seated beside her, were here on vacation from the UK -- they’d always dreamed of high tea at the plaza (why they hadn’t just stopped by for a simple cup of tea was not made clear). And the last of the remaining pupils, seated next to the British duo, was a woman dressed in a tailored gray pantsuit, who didn’t bother to introduce herself at all -- the only real potential New Yorker of the bunch. I watched, intrigued, as the mystery woman took a sip of her wine, leaving her glass curiously unmarked in spite of the dark red lipstick she wore. Like the plaza itself, the patrons were stiff-backed, well-polished, and subdued. But here’s what they were not: millennial New Yorkers. The only real uniting factor amongst the 24 of us, it seemed, was the fact that we’d each paid $125 for two hours of intensive etiquette instruction. Dressed in a black pencil skirt and a feather-collared pink blouse, the infinitely poised Meier began her lesson with a lecture on personal presentation: She recommended that we wear a full body suit in place of undergarments to “keep everything packed in” (my own underwear had come in a five-for-$27 package deal at Victoria’s Secret) and that we never carry more than one bag at a time (I was carrying two tote bags and a purse). She then proceeded to address everything from app dating faux pas to proper “ethnic food consumption” (which amounted to proper spaghetti-twirling) in a way that seemed to walk the line between classic Emily Post-style instruction and a Cosmo dating column. The mother to my right delighted in the spaghetti lesson, waving her fork around in a wand-like fashion in an attempt to mimic Meier. Still, I found myself wondering where the lesson was on sitting through dinner without disrupting an entire restaurant while you photograph every dish on the table (and occasionally other people’s tables) for your not-so-viral food Instagram (arguably one of the greatest millennial offenses of our time). After scrawling a note about “full-body-underwear” illegibly on my notepad, I looked up to find the pantsuit clad woman, who had not so much as lifted her fork for the sake of practice, glancing disapprovingly around the table. I tried to meet her gaze for the sake of solidarity -- as if to say this is all a little absurd, isn’t it -- but she had already returned her attention dutifully to Meier, who resembled an operatic conductor as she continued to wave her cutlery through the air at the front of the room. Meier went on to demonstrate her “swivel and pop” move -- a surefire bend-and-snap-esque method for exiting cabs without flashing the general public, in addition to her quick-change tips for swapping sneakers out for heels. She also had several pieces of advice that were applicable to millennials all over -- like the fact that group photos on dating apps are futile and confusing, and that ghosting is an entirely unacceptable method of shutting anyone down, no matter how many times they reference their frat or their 401K during dinner. Just barely perceptible above the sound of clinking glass and mellow chatter, I heard the pantsuit woman stifle a small giggle -- proof that she, too, recognized some measure of irony here. Once again I tried to catch her eye, but it seemed she was too polite to avert her gaze from our gracious instructor. Amidst all her counsel on social cues, Meier placed particular emphasis on learning how to “get ahead” in a city as cut-throat as New York. “In this city,” she noted, “almost everyone is highly motivated, educated, well-dressed, and professional.” Surely there is no lack of competition. But as Meier sees it, professional business etiquette is what counts when it comes to measurable success. She claimed that many decisions in high-volume HR departments are contingent on the most qualified candidates with the best business etiquette -- that is to say, knowing proper handshake convention (two pumps means business, three pumps indicate social interaction) could be an indirect line to a six-figure salary. She did not, however, manage to address the significance of proper Slack etiquette (tactful gif selection is an art form), which in today’s professional world is arguably a better skill set for “getting ahead” than a strong two-pump handshake. 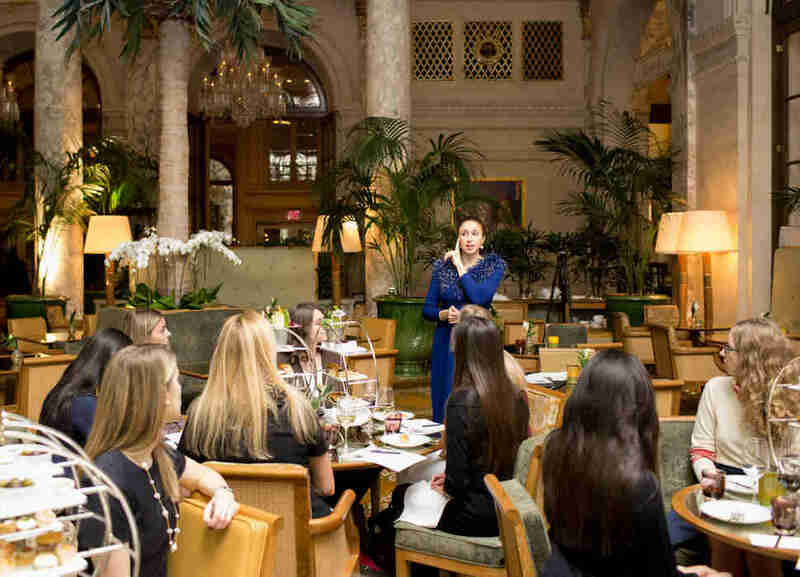 The majority of the Plaza’s etiquette classes (one to two a month) sell out completely -- so, the question isn’t whether or not there is a market for contemporary etiquette, but rather, who the market consists of. Meier’s rendition of social grace is a much-needed update to the Emily Post classics, but for the most part, I would argue that the millennial New Yorker does not, in fact, need to perfect their pasta-twirling methods. 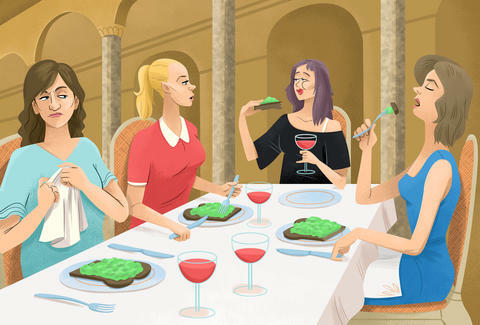 New York does demand an etiquette all its own, but in place of Meier’s course, we might be better off with a lecture on proper subway decorum, UberPool small talk, or how best to host a dinner party when your apartment is the size equivalent of a walk-in closet. As I filed out of the Plaza’s enormous entryway, proudly donning my several bags, I found myself standing across 5th Avenue from the pantsuit woman, cradling a street-vendor hot dog in her left hand and pulling flip-flops out of an enormous black satchel with her right. In spite of her newfound sense of Beaumont polish, she remained an immodest New Yorker, Sabrett hot dog and all -- a small victory for the city. Eliza Dumais is a writer with poor dining etiquette, and excellent social skills on Slack. Follow her @elizadumais.